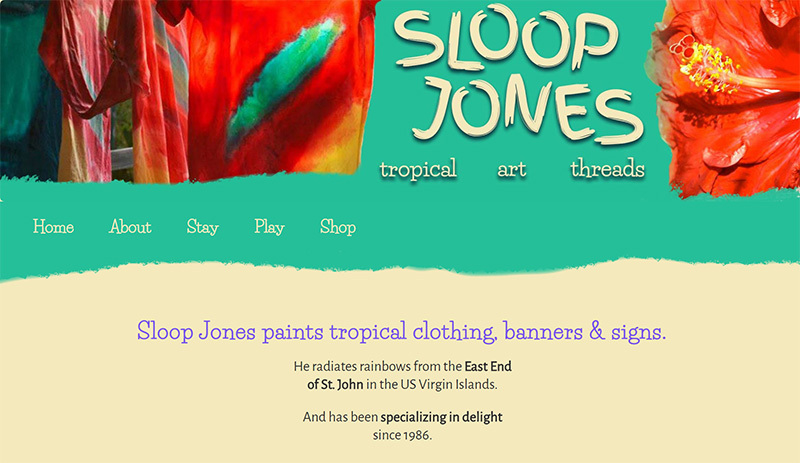 Update the Sloop Jones website from an old-school static HTML model to a modern content management system, using WordPress paired with WooCommerce to power the online shop. 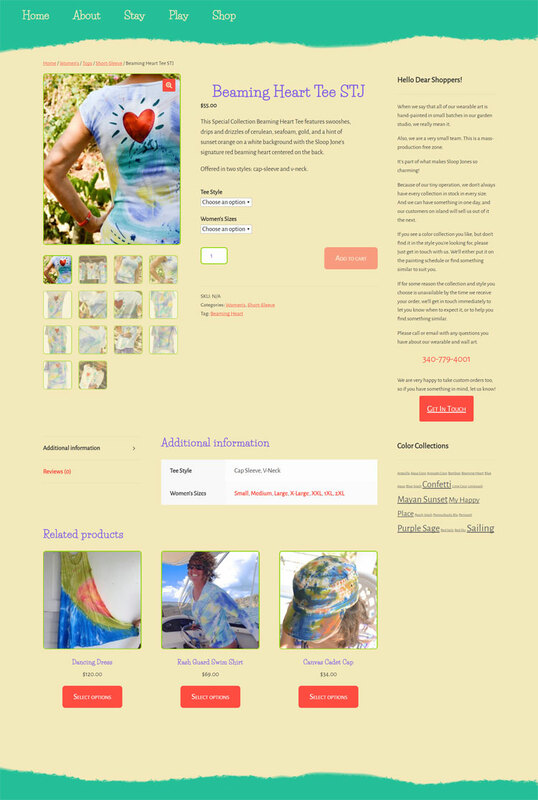 The website aesthetic comes directly from the source: The Sloop Jones Studio and Gallery, located on the remote East End of St. John in the USVI. It’s a special place that, for a few magical years, I had the good fortune to call home. Sloop’s property is gorgeous — full of life and color and whimsy. It’s honestly like no place else in the world, and I wanted to bring that exuberent ambience into the brand’s online space. 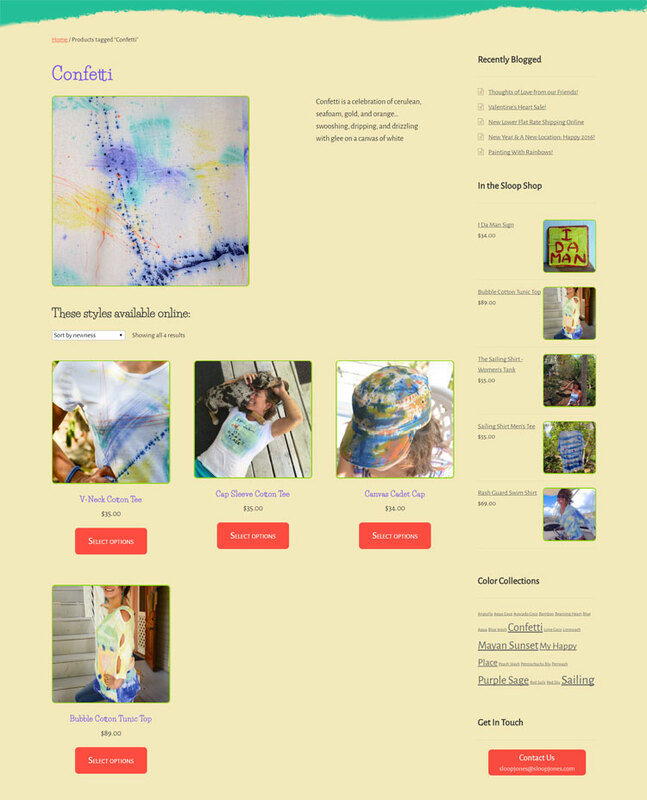 I created four different rotating headers, using photographs taken by the artist of his property and products, sourcing the color palette directly from the designs. While the not-quite-white background and blue-green main accent color are reminiscent of sand and sea, this was not an intentional choice. The background was actually inspired by the dominating wall color in Sloop’s space at the time, and the aqua was sampled from a color collection. And so the beachy vibe — while highly appropriate — was either a subconscious decision or a serendipitous accident. Both, perhaps. From the main About page you can choose to read about The People, The Product or The Place. Sloop (whose given name is Terry) and his late wife Barbara started Sloop Jones together in the early 1990’s. I wrote this right before launching the new website, which was less than a year after Barbara died. 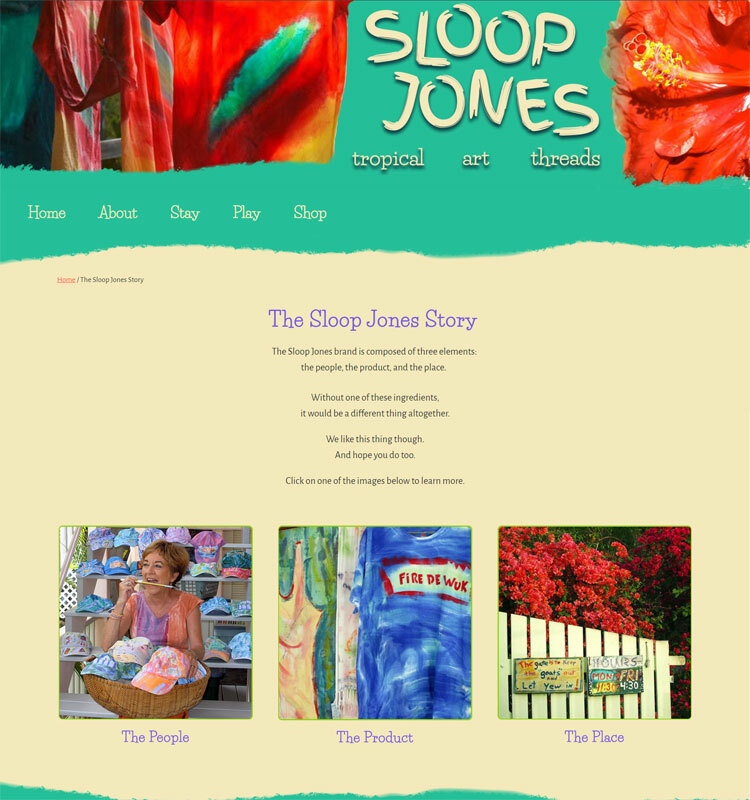 It was important to Sloop that she have a presence on the website, as her energy is still very much a part of the Sloop Jones organization. With the 300 t-shirts they brought from Massachusetts, Sloop and Barbara started what is now an iconic St. John fashion line: comfortable, colorful clothing hand-painted in Sloop’s signature style. In the early days, carrying t-shirts with them wherever they went, they’d sell on the ferry boat to St. Thomas. And when they ran out of merchandise, Sloop and Barbara were happy to sell the shirts off their backs. Almost three decades later, the Sloop Jones brand is a St. John staple, employing several special island folks year round. The one-of-a-kind pieces of clothing and wall art embody what so many people love about the Caribbean—the celebration of color, the stunning natural beauty, the soft trade winds’ breeze, the quirky characters, and laid back vibe— all those things that make island life enchanting. Originally, the product pages were for clothing items only. But now we’ve also created product pages for the Sloop Jones Workshop and the Rainbow Room Vacation Rental (pictured below). We haven’t set them up to book online yet (maybe someday), but there are customized contact forms on each page for people to easily inquire. Every color collection has its own archive page. It includes a close-up image of the design, a written description, and links to the online products available in that collection. This is for the popular Confetti design. The website remains a work in progress. I’ve wanted to tweak the design for a while now, but there are functionality things to do first. UPDATE: Sadly, the Sloop Jones property was substantially damaged during Hurricane Irma. The online store – and all website progress – is on hold while they rebuild.